Camila’s parents fell on hard times when unemployment struck two years ago. Family loyalty and solidarity prevailed. An aunt offered the young couple two rooms in her house where they now live with infant Camila and her brother of 3 years of age. However, the joy of a new baby was tempered by illness and misfortune. Camila was rushed to the hospital with high fevers when she was only four months of age. 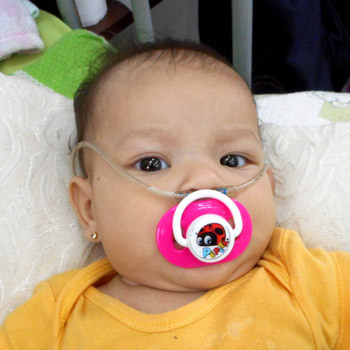 Medical professionals told the family that Camila had an atrioventricular septal defect. This congenital heart defect required surgery. The young couple saved the little money they had for an urgent surgery, but one night, a thief entered and robbed those savings. Camila’s parents turned to Solidarity’s Bridge partner organization in Santa Cruz, Bolivia, and were deeply moved to learn that Camila could receive assistance via the fund that Dharma Social Projects provides for children. Camila’s surgery was successful, and the family is encouraged to move forward, strengthened by the gifts of health and solidarity.